Live streaming and stat links are available here, on the VolleyMob TV schedule. Devaney Center | Lincoln, Neb. There are two teams undefeated in Big Ten action (4-0) and volleyball fans will get to see them face off on Saturday night, when 3rd-ranked Nebraska hosts 4th-ranked Minnesota. The Huskers, who are 13-1 on the season, bring a 13-match win streak into the matchup. Nebraska most recently halted then-undefeated Illinois in 4 sets, Northwester in 3, Michigan State in 4 and Michigan in 4. The Golden Gophers have yet to drop a set in Big Ten play, registering sweeps of Penn State, Maryland, Wisconsin and Indiana. Minnesota has not lost since Sept. 9 (3-1 to Stanford) and owns a 5-match win streak. Huff Hall | Champaign, Ill. The Big Ten presents another Top 10 matchup midweek as 5th-ranked Wisconsin makes the trip to Champaign, Ill., to face 7th-ranked Illinois. Both teams are 3-1 in conference play so far, tied at 3rd with one another. The Badgers’ lone conference loss came on the road at Minnesota, which is ranked 4th in this week’s VolleyMob power rankings. The Fighting Illini’s only loss of the season was to Nebraska, which is ranked 3rd this week. Cliff Keen Arena | Ann Arbor, Mich. The Boilermakers and Wolverines are both in the middle of the competitive Big Ten pack with 2-2 marks. 17th-ranked Michigan plays well at home, earning a 9-1 mark so far this year. The Wolverines have only fallen to Top 10 programs in league play (Nebraska, Penn State). 23rd-ranked Purdue, which has only played 2 road matches so far this season, has only lost to Top 10 opponents as well in the conference season (Illinois, Wisconsin). Pauley Pavilion | Los Angeles, Calif.
Friday is a pivotal match in Pac-12 competition for both 19th-ranked Oregon and 21st-ranked UCLA, as both are tied at 6th in conference standings. After a 2-0 start to league play the Ducks had uncharacteristic losses to Arizona (3-2) and Arizona State (3-0) last week. They look to recover with a victory over the Bruins on the road. UCLA also stands at 2-2 in Pac-12 standings with wins over Utah (3-1) and California (3-2) and losses to USC (3-0) and Stanford (3-0). Mott Athletics Center | San Luis Obispo, Calif. This is a major meeting in Big West Conference play, as Hawaii makes the trip to face 13th-ranked Cal Poly in San Louis Obispo, Calif., on Saturday. 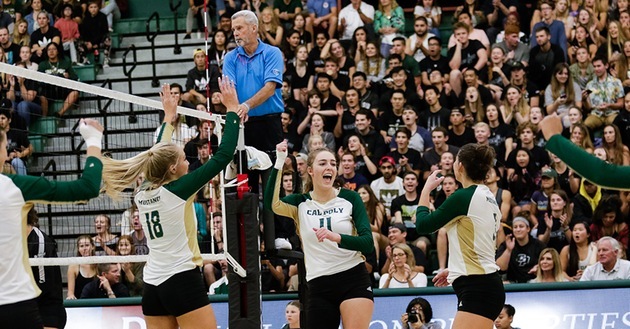 Cal Poly owns a 5-0 mark in Big West action and has won 22-straight conference matches dating back to 2016. The Mustangs have also won 16 consecutive home matches, so the Rainbow Wahine have their work cut out for them. Hawaii is also undefeated in league play with a 4-0 record. The Rainbow Wahine have swept all but one conference opponent this season (UC-Irvine; W, 3-2).